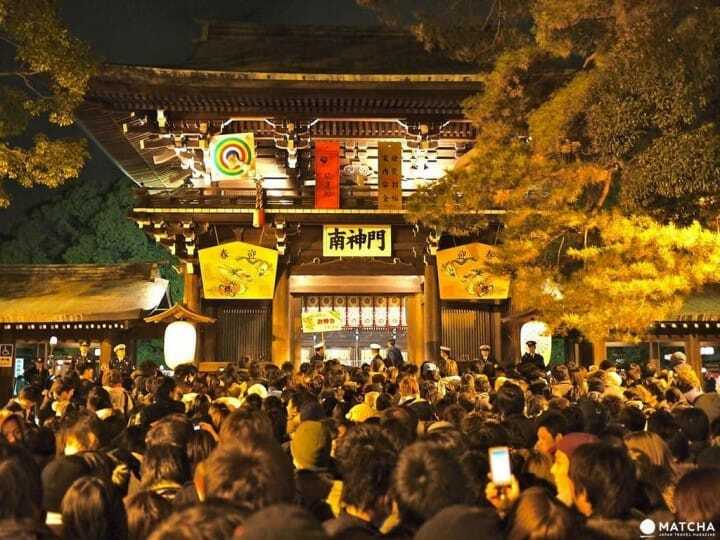 https://matcha-jp.com/en/5532 New Year's Eve In Japan - Traditional Celebrations Or A Party?! New Year's Eve In Japan - Traditional Celebrations Or A Party?! The New Year is an exciting holiday everywhere in the world. However, although we all celebrate the same thing, we tend to celebrate it differently. If you are in Japan for the New Year you might be surprised that instead of a big party, New Year's Eve in Japan is a quiet evening spent with one's family. Even so, you can actually choose between following the Japanese traditions or experiencing a modern twist on the New Year celebrations in Japan. Traditional Oshogatsu (New Year) decorations are available at many shops around the New Year. These include outdoor and indoor decorations. They usually feature branches of pine tree, which symbolizes longevity and good luck, and bamboo which is a symbol of good health and resilience. Some of the decorations might also feature fruit such as mikan (Japanese mandarines) or the red berries of the plant called senryo (literally "a thousand coins"), which are symbols of wealth and prosperity. So how about getting a traditional decoration filled with auspicious symbols? If you really want to follow traditions, cleaning your house on New Year's Eve is very important. It is believed that one needs to welcome the New Year with a clean house. A New Year's Eve dish that can't be left out is Toshikoshi Soba. There are many ways to eat soba noodles, but whatever you do, don't cut them, since they are supposed to be long and in one piece to signify a long life and happiness. The traditional Japanese New Year food called Osechi, which consists of various dishes with auspicious significance, is eaten on New Year's Day. As it takes a lot of time and care to prepare it, many people nowadays decide to buy it from the stores to save time. However, you have to order it in advance. After midnight you can go to a shrine and make a wish for the New Year. This first shrine visit of the year is called hatsumode. The more popular the shrine, the more people will be there, so you might have to line up. You can either go during the night or during daytime on the first seven days of the New Year. Only on New Year's Eve, most of the trains and buses in Tokyo run all night, so don't worry about the time. You can choose your favorite shrine or temple to visit. Another activity that the locals usually do on New Year's Day is witnessing the first sunrise of the new year (hatsuhinode). Popular places for this tradition are beaches, rooftops, and tall buildings. The time around the New Year is traditionally spent with one's family. That is why it is very common to send presents and New Year greeting cards (nengajo) to friends and relatives. The older family members usually give money in a small cute envelope called otoshi dama to the youngest members of the family. For more on Japan's New Year traditions, please read The New Year Essentials In Japan and Exploring Japan's New Year Traditions. Both Japanese people and visitors to Japan sometimes prefer a change, especially if they have already experienced the traditional Oshogatsu. Even if you are visiting for the first time, you might still prefer a loud, wild New Year party like you might be used to. In that case, there are plenty of options for you. Although it is not really a popular option and not very common in Japan, you can enjoy a street party at a few places in Japan. The one held in Shibuya is probably the most popular. On the evening of December 31st, people will gather here chattering and drinking while they wait for the countdown which will be projected on one of the buildings. Shibuya is always a fun place to be, but be warned that on New Year's Eve it gets crowded and you probably won't be able to party until the morning. The police is trying every year to get everyone to disperse right after the countdown. A New Year event that has been growing in popularity in recent years is the Oji Fox Parade held in Oji, a town in Tokyo's Kita ward. Oji is famous for its Inari shrines and connection with sacred foxes, which are considered divine messengers. At the parade, you'll be able to enjoy the sight of people wearing fox masks (or even join them! ), as well as old Japanese rituals that have been around for centuries in that part of the city. If you prefer fireworks, you might want to try the countdown parties in Odaiba or Ikebukuro. Most of the bars and clubs in Japan hold countdown parties. Check out your favorite bars and try to get a reservation in advance if you want to choose this option. Another popular option is going to karaoke with friends. In order to celebrate on a grander scale, you can go to countdown concerts or on a countdown party cruise around Tokyo Bay. If you love Disneyland, they also do a countdown event on December 31st. Whatever you do, early reservation is key! You can always customize traditions. Many Japanese people enjoy going on onsen trips with their families, instead of staying home and cooking elaborate meals. There you can relax completely without any chores. If you'd like to enjoy a relaxing time around the New Year, how about checking one of Japan's best 10 onsen to visit in the winter? You can also combine different options. Many people may enjoy a in a bar or club and then hurry to the countdown in Shibuya. Afterward, they might head towards one of the shrines or temples for hatsumode after midnight. If they still have the energy, they might go to the first sunrise viewing as well! New Year's Eve is a really special night and everyone wants to make it memorable. Enjoy the New Year Celebrations in Japan! Once you look at the options for spending a memorable New Year in Japan, you'll find that there are actually many variants to choose from. You might want to try a traditional New Year or party out with friends, or even choose to enjoy as many different options as you can during this one special night. Whatever you choose, don't forget to have fun and enjoy the end of the year while celebrating the beginning of the year to come! From Lucky Bags To Shrine Visits - Enjoy New Year The Japanese Way!